Ross County's Josh Mullin is challenged by Morton's Rory McKeown. Morton came from behind to defeat Ross County 2-1 at Cappielow thanks to Bob McHugh’s late strike. Don Cowie, making his first start for the Staggies since returning to the club from Hearts, netted the opener after 58 minutes but former County midfielder Michael Tidser equalised for the hosts with a fizzing long-range effort. 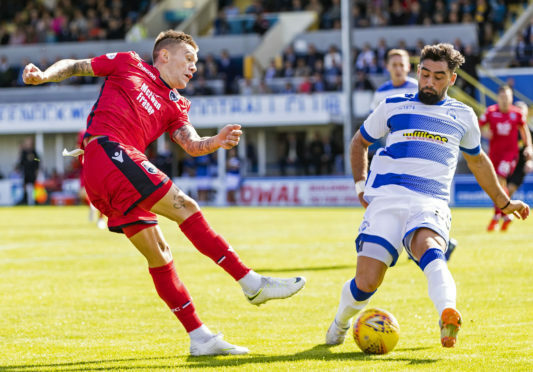 Morton claimed all three points with 12 minutes remaining when McHugh fired home with former Ton player Michael Gardyne inches away from a late leveller. The Staggies were the only team in the Championship to take maximum points from their opening two games but Morton sat just behind them in second place and two points adrift. County made three changes to the side that started last week’s 3-2 Betfred Cup defeat at Hibernian with vice-captain Liam Fontaine, Tony Dingwall and recent signing Cowie all in from the start in place of Marcus Fraser, Jamie Lindsay and Keith Watson. The visitors should have taken the lead after 15 minutes when an inch-perfect cross from Dingwall found Ross Draper unmarked but his header from only six yards out kissed the crossbar on its way over. Morton had a penalty appeal waved away four minutes later when the hosts felt Cowie had used his hand to prevent a Gregor Buchanan header finding the back of the net. Morton defender Reghan Tumilty, playing against his former side, volleyed over the bar before Cowie rounded goalkeeper Ryan Scully at the other end but was unable to tee up Gardyne from a tight angle. The hosts had a second appeal for a penalty turned down six minutes before the break when Ross MacLean tumbled in the area following a challenge from Draper. Former Caley Jags midfielder Draper had another chance to get on the scoresheet two minutes after the restart when he got on the end of a Sean Kelly free kick but his effort was cleared off the line by Jack Iredale. MacLean pounced on a loose pass from Callum Morris at the other end but his eventual shot found the side-netting. The game needed a goal and it finally arrived in the 58th minute when an exquisite pass from Iain Vigurs sent Cowie through on goal and the former Hearts midfielder calmly stroked the ball beyond the advancing Scully. But the lead lasted only two minutes when former County midfielder Tidser unleashed an unstoppable drive from 30 yards that flew past Scott Fox for his fifth goal of the season. County made a change with Brian Graham coming on to face his former club with Declan McManus making way. The striker almost made an immediate impact but his downward header from Dingwall’s deep cross was well saved by Scully. But it was Ray McKinnon’s side who grabbed the crucial next goal with 12 minutes remaining when a Denny Johnstone flick fell perfectly for McHugh who fired home on the turn. With time running out for the Staggies, Gardyne went close to levelling with a fine effort that flew agonisingly wide.